Olivia Laing’s The Trip to Echo Spring: Why Writers Drink is an in-depth investigation of the relationship between writers and alcohol. Laing grew up in an alcoholic family, and laces her own unsettling memories among her exploration of six alcoholic writers, as she wends her way, literally, across their American landscape: John Cheever’s New York, Tennessee Williams’s New Orleans, Ernest Hemingway’s Key West, Raymond Carver’s Port Angeles. In an act of self-preservation she selects only male alcoholic writers (F. Scott Fitzgerald and John Berryman are included), as female alcoholics are too close to home. This multi-layered exploration of the horrors of alcoholism quickly disperses any notion of romance when it comes to creative genius and intoxicated exuberance. 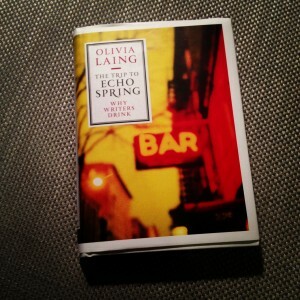 The destructive angry hurt alcohol leaves strewn across the pages had me struggling to comprehend how Laing herself was able to enjoy a drink at various points on her journey: it quite put me off my wine. The Trip to Echo Spring (or Echo Falls as I kept awfully, ironically miscalling it) was shortlisted for the 2013 Costa Biography Award. Laing’s discriminating descriptions of the American landscape are light and poetic, her prose sculpted and erudite, her research thorough and weighty. This is a beautifully written journey through land, time and the bottle. More than a mere biography – though there is plenty of meaty detail of the writer’s lives, loves and losses – it is an exploration of addiction and the darker things that drive and threaten to tear us apart. It drove me to previously undiscovered texts and to revisit old favourites, armed with new insight. This book will satiate those who enjoy reading about their literary idols. But Laing provides more than hero worship for other readers – she delivers a text that offers a greater comprehension of human nature: what drives us, what can destroy us, and ultimately what can redeem us. Like a hangover lingers after you finish your final glass, this book will stay with you long after you’ve digested the final page.